To the extent possible, residents will be involved in the building process so that they may earn “sweat equity” toward the value of their shelter. We have partnered with architects and builders who have volunteered to assist in the construction of the village and to hold hands-on workshops constructing simple, compact, and inexpensive structures. Along with individual homes, the village will include a kitchen and dining area, bathrooms with showers, a gathering space for meetings, and opportunities for gardens and micro-businesses. This is described in more detail on the following pages. Village Council: Based on best practices throughout the Northwest, the community will be governed by a Village Council. The members of the Village Council will be residents of the Village elected by other residents. Specific roles will be identified and filled in order to maintain a safe and sanitary environment. Weekly Village meetings will be held in which all residents vote on issues effecting the community. Community Agreement: As a requirement of residency in the Village, all applicants will sign a Community Agreement that states expected behaviors and consequences for violations. See the initial OVE community agreement on page 9. Volunteers: Support and oversight from volunteers is another important piece. Over time, the need for this assistance will likely decrease as the villagers themselves take more responsibility. 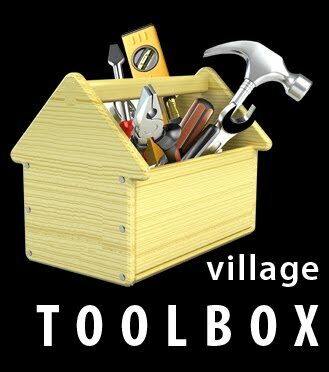 Security: The Village will have a single entrance/exit that will be staffed by residents and trained volunteers. Every resident will share security duties and designated members of the Village Council will be authorized to take immediate action with regard to any violations of the Community Agreements. The Eugene Police will be welcome to patrol Opportunity Village as they would any other neighborhood in Eugene, and we anticipate developing a strong relationship. In a situation in which resident and volunteer security staff is unable to gain cooperation of a resident, the police will be called for assistance. All visitors will be required to register at the front gate and be escorted by a resident. Financial: The project is dependent upon a piece of land being provided at no or little cost through a lease agreement or other legal arrangements. We will maintain an active fundraising program to cover monthly operating costs. Residents will contribute to the operating costs either from their own income or through micro-businesses that will be developed in which residents provide goods or services to raise money. The capital budget will be kept small by the ecological philosophy of the Village with a long-term goal of self-sufficiency. Transitioning Out: Each Villager, after an initial period of acclimation will, with support, form a plan for moving on. We will continue to develop relationships with existing social service agencies such as First Place Family Development Center, ShelterCare, and St. Vincent de Paul to house clients while on a waiting list for their services and to inform interested Villagers on the availability of services. There are essentially three avenues to housing when leaving the Village: villagers may access their own housing, supportive housing, or alternative housing. Some villagers may have found employment or part-time income from jobs or micro-businesses. 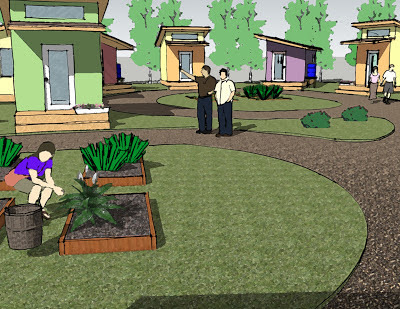 Others will have accessed benefits or returned to their families while others may choose alternative living styles such as creating or moving to an existing eco-village, intentional community or CSA collective. In some instances, an individual might transport their shelter to the alternative living space or arrange for a legal space in a backyard, a growing phenomenon in Eugene. While in the Village, residents have the opportunity to learn skills to adjust to a new style of economy and sustainable living. Avenues to re-integrate into the larger community will be continuously explored and creatively and aggressively pursued. Evaluation: Records will be kept to determine where residents are coming from, where they go when they leave, whether new sources of income or employment have been generated, as well as general population demographics and other data. 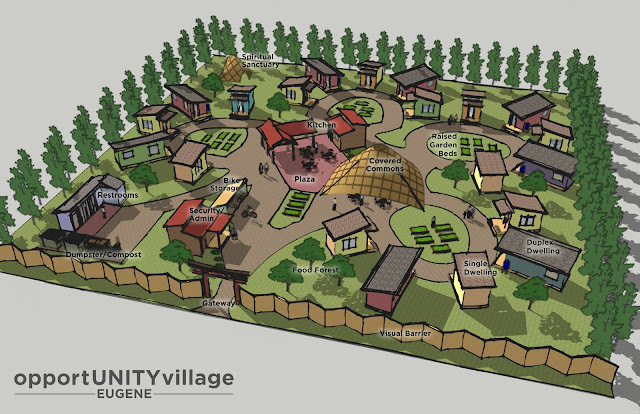 The primary purpose of the evaluation will be to see if Opportunity Village Eugene is meeting its primary goal of transitioning people without housing back into the community. The evaluation will also provide information on which aspects of the program are most effective. Long-Term Vision: If the pilot program is found successful, we would advocate for a network of villages throughout the city to share the opportunity and responsibility of a project like this. Exit Strategy: OVE does not intend for each transitional housing village to be a permanent land use. Ideally, these sites would serve as placeholders and catalysts for future affordable housing projects, which often involve a lengthy process before development occurs. Residents of the village could serve as key stakeholders in the planning and design of the affordable housing, and it could be inspired by the community-oriented principles of the Village. In this case, the transitional village could likely be a temporary use of between 2 and 5 years. As affordable housing blooms, a new transitional village could be established elsewhere in the city. The village will evolve to incorporate the following components. Costs of structures will vary depending on the use of donated and recycled materials. Village Gateway: An appropriately designed and crafted landmark that will introduce residents and visitors to the sustainable vision of Opportunity Village. Welcome, Security, Administrative, Information Kiosk: Located just inside the Village Gateway, this multi-purpose structure will be staffed by one or two village residents and/or OVE volunteers to provide 24/7 security. Bicycle Parking: Secure and covered bicycle parking areas. Single Dwellings: Approximately 60-100 sq. ft. shelters with lockable doors that meet basic sleeping, storage and comfort needs for an individual. Dwellings will not have individual utility hook-ups. Duplex Dwellings: Approximately 80-120 sq. ft. shelters to accommodate couples and small families. Raised Garden Beds: Simple raised beds of varying sizes to provide organic food, the opportunity to take responsibility and an aesthetically pleasant environment. Kitchen and Food Storage: Enclosed space for preparing meals and storing food with a covered area for cooking. Village Commons (Gathering/Dining Area): Covered area that can accommodate 30 people with central utility hook-ups. This space will accommodate informal and scheduled activities such as village meetings, celebrations, public speaking and other important events. This central area will create a membrane between the public and the private space of the village. Bathroom, Shower, Laundry Complex: Three flush toilets (one which is ADA accessible), two showers and a washer/dryer to support the village. Trash, Recycling, Compost Bins: Clustered for ease of access by service trucks. Defined Path Network: A defined, gravel path network that connects the various nodes of the village and reduces mud during the wet season; also consider fire access lane if necessary. Parking/Loading Area: An area where volunteers can temporarily park to visit or unload materials and donations; on-site long-term parking for village residents will be minimal. Visual Barrier: A visual barrier of some form to screen the village while also providing privacy. Micro-Businesses: Accommodate independent work areas and feature display counters and windows where village residents can sell or trade their goods and services. Donations In-take: A space to accommodate incoming donations to be organized and moved to the Village Store. Village Distribution Center: This structure will distribute all supplies and materials acquired by and donated to the village. Items will be sorted, organized and displayed for villager use. These items will be part of the local village economy of sharing with a means of exchange yet to be determined. Spiritual Sanctuary: Quiet space for residents to worship, meditate, heal, or recover. Workshop Space: A covered area to construct individual dwellings. Social Service Meet-up/Healthcare: Designated, private areas where village residents can seek guidance and care. Village Farm: Larger agricultural initiatives could be started on satellite sites to provide economic opportunity and advance the goal of self-sufficiency. Opportunity Village Eugene (OVE) will embrace innovative and varied solutions to the provision of shelter by accommodating diverse needs and allowing for individual expression. All structures at Opportunity Village will be built in accordance with applicable safety and structural standards. To ensure this, a “Village Building Guide” will be incorporated into the design and construction process, similar to a city building code. 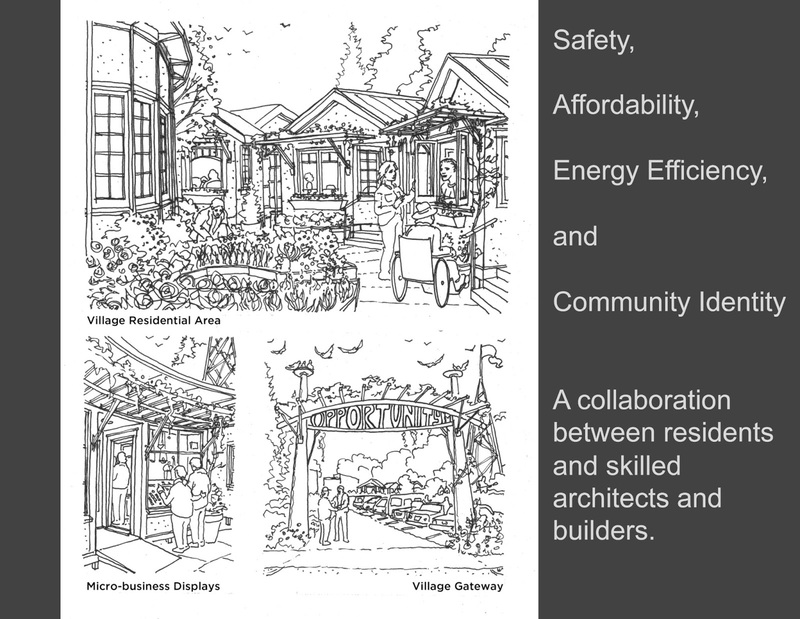 The foremost guideline is that all village construction demonstrates safety, affordability, energy efficiency, and community identity. Sustainable design features will be encouraged such as water catchment, trellises, and passive solar design. As much as possible building materials will be donated, recycled, re-used, natural, and energy efficient. Looking at the city we see an excess of high quality materials heading to landfills, lots of people who need something to do, and the damaging effects of not having a stable space to call home. We see the need for some kind of security in place, a sense of place, of purpose, and of belonging. It seems only logical then to utilize the resources within our community to develop a cost-effective solution for approaching the issue. OVE is developing a Village Structure Catalog, which documents compact and sustainable structures proposed by architects and builders. These “Village Builders” have expressed a commitment to lending their skills by holding hands-on workshops. The builders will introduce an undemanding process for constructing their structure, and then locate residents within the village that could then replicate this process and teach others. This allows all members of the village who are able, to directly participate in the construction of their own shelter while acquiring practical skills and relationships for the future. Remember the days when selling life insurance met sitting across the kitchen table from your client while you both missed your favorite TV program? Those days are no more. The best prices now come from internet Trucking Insurance sales. This article tells you how to succeed in the booming direct marketing life insurance business. Wow! It's really appreciable. By the by, the benefits of crowdfunding for supporting needs of society are just untold. It can change and save someone's life.